mid-March 2013 - All the puppies have found homes! We were watching an old episode of the detective mystery "Colombo" when Brynja, sitting on the couch next to us started acting like it was time. Earlier in the day she was denning outside under our pottery benches. Had a hard time getting her to come out - in the middle of the summer it wouldn't have been a bad spot to have puppies, but in January with single digits in the forecast it wasn't going to work. Off to the whelping box we went where, after a spirited fight with the bedding towels, Brynja's first puppy, a female we named Alfdis (elf goddess or female guardian spirit), was born. It would be two more hours, with a number of contractions that didn't lead to a puppy and had us worried, that the second female appeared, Varda (stone cairns, also, in Tolkien, one of the Valar, a group of semi-divine beings, and also known as Queen of the Stars - within her face radiates the light of Iluvatar), and at the same time the first male, Alfur (elf). 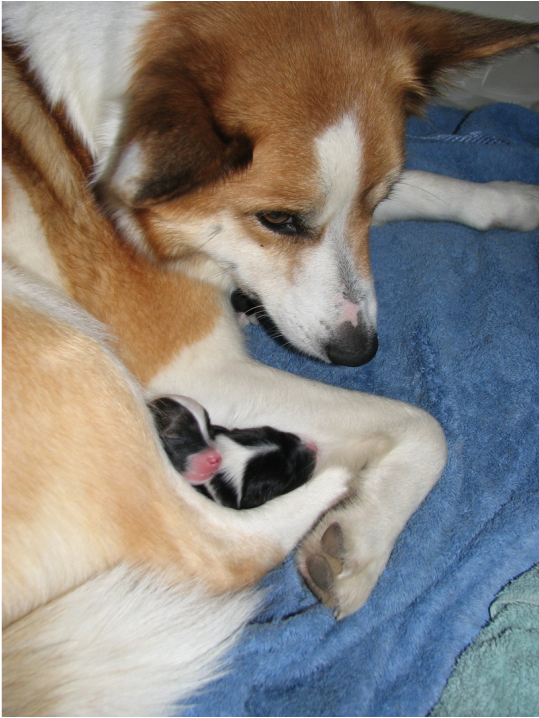 About a half hour later the last puppy, a male we named Vargur (wolf, pushy - one of his sire's traits) was born. Alfdis (Elf Goddess) is living in Brunswick, Maine with her owners and 3 children (6, 9 and 11). The first thing you notice about her are the blotches and strips of white fur on her back amidst the dominant tan coat. This unique pattern may be what is termed "Reverse-pied." Alfdis is the most playful of the puppies. She was the first to initiate play with her littermates. Varda (Queen of the Stars) is living in Woodstock, Vermont with her owners, a cat and a small group of children who attend pre-school at her house. She is indeed the queen of this litter. The biggest puppy at birth, she's maintained that vigor at two weeks. She was the first to open her eyes. She also has a bit of an independent streak, often sleeping away from the puppy pile and often off exploring by herself. Though she has Galdur's tricolor coat, I suspect she will take after her mom in being fearless. Alfur (Elf) is living in Mechanicville New York with his owners, another Icie, an American Eskimo dog, a few sheep, a flock of chickens and pheasants. Likes to sleep on his back more than the other puppies. Which is good for showing off the double dewclaw on his right front paw (see picture 5). While it's typical for Icelandic sheepdogs to have double dewclaws on their rear legs, it's rare to have them on a front leg, and even rarer to have them on both front legs. For an interesting discussion of double dewclaws in Icelandic sheepdogs, check out this blog post by Jim Hansen of Vinland Icelandics. Vargur (Wolf) is living in Roseville Minnesota with his owners and their 3 children (20, 18 and 16). The first thing I notice about him is the symmetry of his coat color pattern. From the eye patches of tan on a white head to the white creeping up from his belly to the white "socks," he's inherited Galdur's symmetry. It's early yet but he's becoming my favorite puppy in the litter. Like his father he's very affectionate, being the first puppy to lick my hand as I held and massaged him. And he likes cuddling with me and with mom more than any of the other puppies. Vargur is the most serene of the puppies. Oh he gets into his share of puppy tussles, but he spends a fair bit of his time watching the tumult. Good chance he will be like Galdur in not being an excessive barker.